I love the warmth of flannel sheets, specially on cold winter nights like yesterday’s, when it got done to -25 F. My husband doesn’t really like them, though he has tolerated them the past couple of winters here in Colorado. Then I had an idea… how about sewing up some sheets that would be flannel on my side of the bed and the cooler regular cotton on his side? I did that yesterday, with a bit of help from him, and we are both pleased. Here’s how to do it, step by step. The hardest part is simply being sure that you cut and pin correctly. 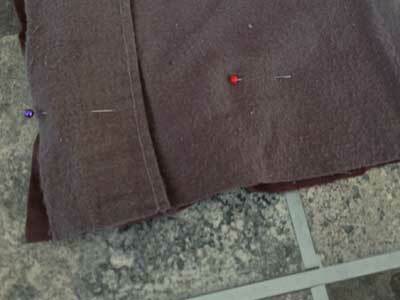 The sewing is easy. Update: I discovered that you can buy sheets like this, ready made. That’s great, since far more people would like these than would want to sew them! Here’s a set: “Split the Sheets” Sheet Set – Queen – Light Green. On that page you can also get king size and a couple of other colors. It says in the text that it is for people where one wants less warmth than the other. If you look elsewhere, do be aware that the expression “split sheets” is also used to mean the situation where the bottom sheet fits on a king bed and there are two top sheets separate from each other. Not what I want! A sewing machine, scissors, tape measure, pins, thread, an iron. CUT: Fold one of the flat sheets in half lengthwise and put it on a flat surface for cutting. I used our living room floor. Get the line you will cut reasonably straight, then put your scissors in the crease and cut the length. You are cutting the sheet from the middle of the top to the middle of the bottom. CHOOSE: Let’s say that you are cutting the flannel sheet and that you usually sleep on the right side of the bed, as viewed from the bottom. Choose which of the two halves will go on your side of the bed. Put that half-sheet somewhere for pinning and put the other half aside. REPEAT for the other flat sheet. PIN your two flat sheets together, right sides together. Here, the lighter colored flannel is above the slightly darker regular cotton. The pins are in this direction so the fabric would be to the left of the machine, or I could have turned it all over and started with the regular sheet on top. 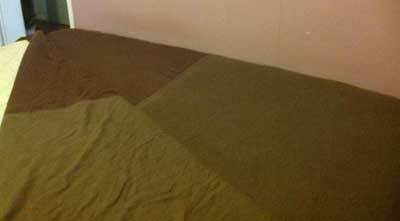 Spread out one of the fitted sheets on your bed, in the way it would go if you were putting it on the bed. You can see the little white tag on the right… we found that helpful in getting the sheet right. Watch out that you don’t get off by ninety degrees here! 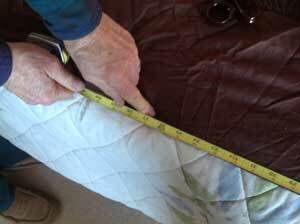 Measure between the bottom right and the bottom left, between the points that would be on the corners if the sheet were on the bed, not between the corners that have the elastic sewn to them. Mark the midpoint, and then make a cut there. (The reason it looks in the photo like it’s the very edge of the sheet is that we have the extra folded under.) 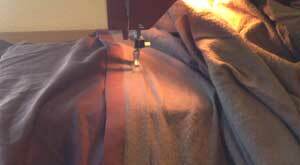 Do the same on the top of the sheet, then fold the sheet out on the floor and cut from one end to the other. Do the same for the other fitted sheet. PIN the two fitted half-sheets together, right sides together. For the fitted sheets, it doesn’t matter as much about choosing which two halves you will use today. It mattered more on the straight sheets so you would have the nice top ends together. You now have two pinned sheets, the straight and the fitted. Put the extra bits of sheeting away, as you can make another set with them sometime. I put my extras in one of the matching pillowcases. 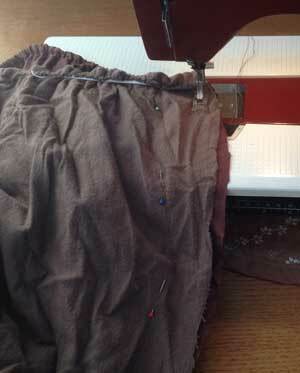 Sew the two long seams. I simply used a medium-length straight stich. In this photo, I am just starting the fitted sheets. I used a fairly small seam allowance on the fitted sheets because I wanted the sheets to come out close to the same size as they began, but I made it wide enough that I could do the next step. Now, you could consider that you were all done at this point. But I wanted the seams to lie very flat in the middle of the bed, so I ironed the seams open, tucked each kind of sheet under itself, and sewed the lengths twice more. In this photo, I am sewing the flannel side. Making the bed was fun. Yep, it all turned out! 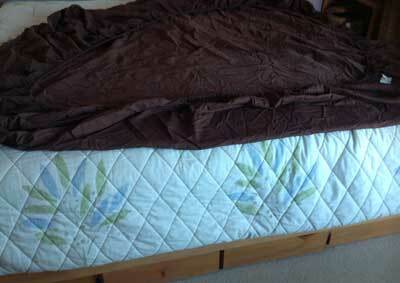 Here, the new fitted sheet is on the bed, and the new flat sheet is pulled back at an angle. One of our cats is watching from the doorway, about to jump on the bed. I am surprised that split sheet sets like this aren’t widely available.